This song is off the hook, I just finished listening to it and it's KRAYZIE! Peep the album "T.H.U.G.S. : Trues Humbly United Gatherin' Souls". If you don't like these songs send us an email @ bonepalace@hotmail.com and request a song. Week One: Friday, August 5, 2005.....Flesh-N-Bone feat. Layzie Bone "Northcoast"
Week Two: Friday, August 12, 2005.....Bone Thugs-N-Harmony "Battlezone"
Week Three: Friday, August 19, 2005.....Krayzie Bone "Mangled"
Week Four: Friday, August 26, 2005.....Bizzy Bone "Father"
Week Five: Friday, September 02, 2005.....Bone Thugs-N-Harmony feat. Eazy-E "BNK"
Week Six: Friday, September 09, 2005.....Bone Thugs-N-Harmony "Hatin' Nation"
Week Seven: Friday, September 16, 2005.....Bone Thugs-N-Harmony "It's All Real"
Week Eight: Friday, September 23, 2005.....Bizzy Bone "When Thugz Cry"
Week Nine: Friday, September 30, 2005.....Bone Thugs-N-Harmony "Get up and Get It"
Week Ten: Friday, October 7, 2005.....Bone Thugs-N-Harmony feat. Mariah Carey "Break Down"
Week Eleven: Friday, October 14, 2005.....Bone Thugs-N-Harmony "Playin' The Game"
Week Twelve: Friday, October 21, 2005.....Bone Thugs-N-Harmony "U Ain't Bone"
Week Thirteen: Friday, October 28, 2005.....Bone Thugs-N-Harmony "Mo Murda"
WeEk Fourteen: Friday, November 4, 2005.....Krayzie Bone "Thug Mentality"
Week Fifteen: Friday, November 11, 2005.....Flesh-N-Bone "T.H.U.G.S." Week Sixteen: Friday, November 18, 2005.....Bone Thugs-N-Harmony "Thug Music Plays On"
Week Seventeen: Friday, November 25, 2005.....Bone Thugs-N-Harmony "POD"
Week Eighteen: Friday, December 02, 2005.....Krayzie Bone "Lock Down Love"
Week Nineteen: Friday, December 09, 2005.....Bone Thugs-N-Harmony feat. 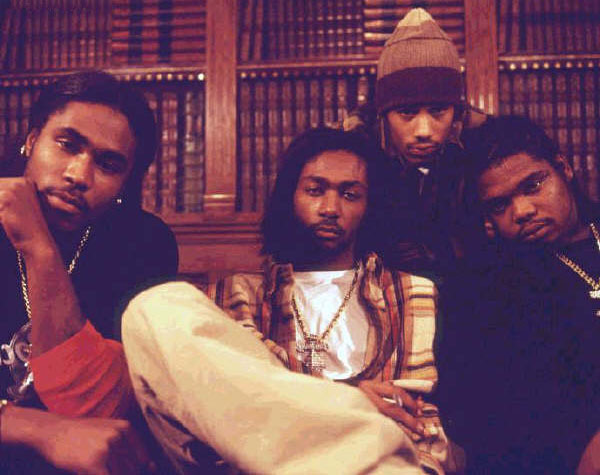 F.i.s.-T & Thin-C "Put Yo' Hands Up"
Week Twenty: Friday, December 16, 2005.....Bone Thugs-N-Harmony feat. K-ci "Thug-A-Tone"
Week Thirty-Five: Friday, March 24, 2006.....Chamillionaire feat. Krayzie Bone "Ridin'"
Week Thirty-Six: Friday, March 31, 2006.....Krayzie Bone "Drama"
Week Thirty-Seven: Friday, April 07, 2006.....Krayzie Bone "Smokin' Buddah"
Week Thirty-Eight: Friday, April 14, 2006.....Krayzie Bone "Blaze It"
Week Thirty-Nine: Friday, April 21, 2006.....Flesh-N-Bone "Sticks N Stones"